Brasov is surrounded by the southern Carpathian Mountains about 100 miles north of Bucharest with the two cities connected by a relatively slow but reliable train service that takes about 2 hours 40 minutes to complete the journey. The fastest trains are the Inter Regio (IR) services where reservations are obligatory. Buying tickets is easy although at busy times of the day there may be lengthy queues. However booking via the Internet is also possible and easy to do. I took the 09.03 departure south to Bucharest which arrived on time from Sibiu. 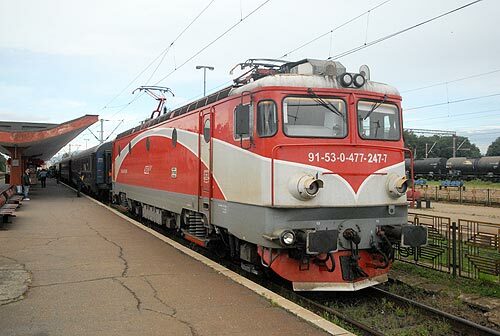 After changing from diesel to electric traction, departure was on time, which was maintained all the way to Bucharest. Immediately the line starts to climb into the mountains. Speed is slow and you have plenty of time to enjoy the countryside with wild flowers in abundance, conical haystacks dotted across the pastures, wooden chalets and shepherds with their flocks. This is all set against the densely wooded mountains with their steep sides and jagged peaks. The climb continues with the lines splitting and using tunnels to reach the summit of the line at Predeal. Despite the train having express status only a few stations are missed until Poliesti is passed. Heading downhill from Predeal there are good views of the mountain particularly on the right. I spotted a makeshift gypsy camp beside the line constructed of cardboard boxes covered in polythene sheets .The police boarded at Busteni casting a suspicious eye over the passengers on the train. More mountain scenery, with one jagged peak occupied by a large crucifix. Well kept gardens complete with gnomes and other ornaments suddenly became common. The police ejected a couple of undesirables at Sinaia where the train was boarded by a number of vendors including one selling punnets of fresh raspberries. Sinaia station has a preserved steam loco on a plinth (230-039). Continuing downhill there is some evidence of redundant industry with modern industrial units having taken their place. You will also note that the train has speeded up after considerable investment in rail infrastructure improvements. Reaching Campana the mountains are left behind with low hills flanking either side of a wide valley. Ploiesti Vest is the last stop before crossing the plains non-stop to Bucharest. Either side of the railway are extensive fields of corn and sunflowers stretching as far as the eye can see. Soon the outskirts of the capital are reached followed by a cautious approach to Gara Nord and the end of the journey.